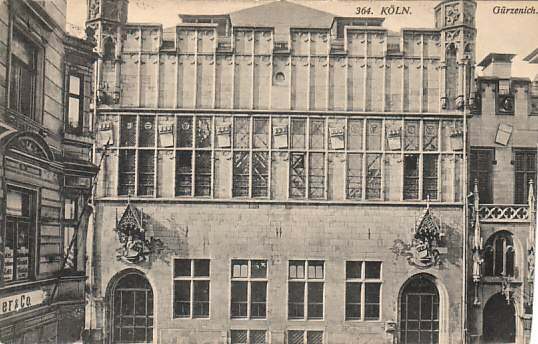 Built 1441-1447 as a municipal dance hall and department store. 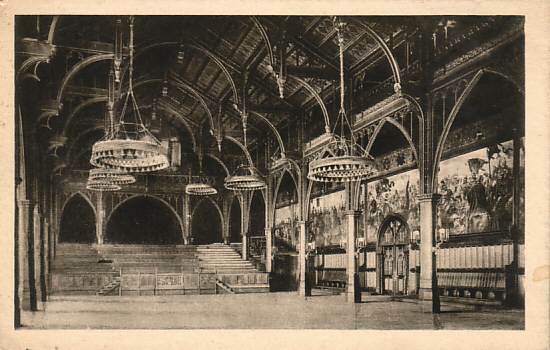 The festival hall located on the upper floor was used for municipal festivites and functions, the ground floor was used as a department store. In the 17th century, the whole building was only used as a department store. From ca. 1820 revival of the building as a festival and concert venue. Since then also used for carnival balls. 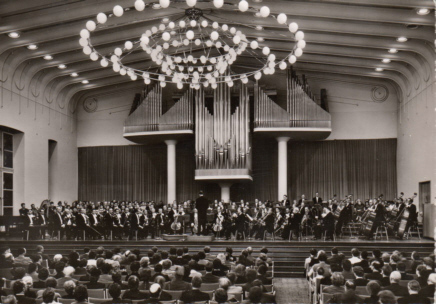 From 1857 to 1986 home to the Gürzenich-Orchester. Extensions in the 19th century. Ground floor used by the local Stock Exchange. Destroyed in 1943, with only the exterior walls remaining. 1952-1955 rebuilt by Rudolf Schwarz in modern style within the existing walls, incorporating the neighbouring church ruin St. Alban. 1996-1997 renovations and modernization, conversion into a congress centre. Currently mainly used for congresses, exhibitions, concerts, and carnival balls. The building includes two halls: Großer Saal (1101 seats) and Isabellensaal (234 seats). Front Text: "Köln a. Rh. - Gürzenich - Saal"
Front Text: "Köln - Gürzenich"
Reverse Text: "Köln - Gürzenich, Großer Saal"
Publisher: E. Coubillier, Köln; Kölner Görres-Haus G.m.b.H. 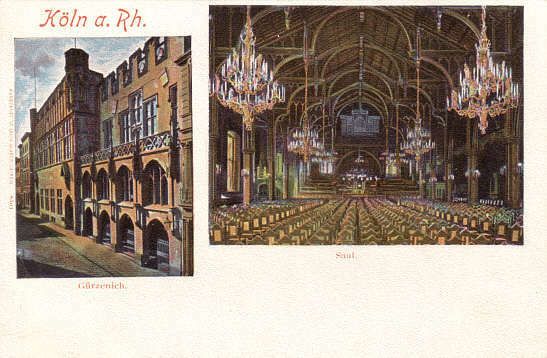 Reverse Text: "Köln am Rhein - Gürzenich, Festsaal mit Gürzenich-Orchester"